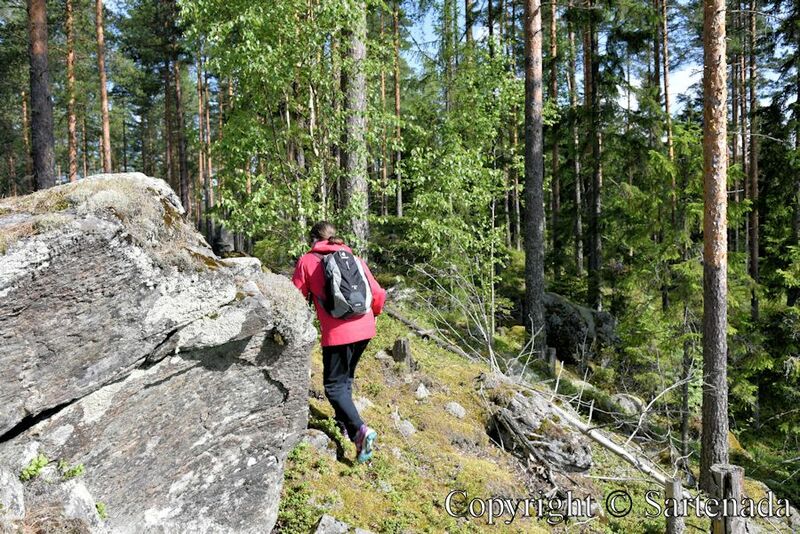 Anja leads You thru the forest to some boulders. 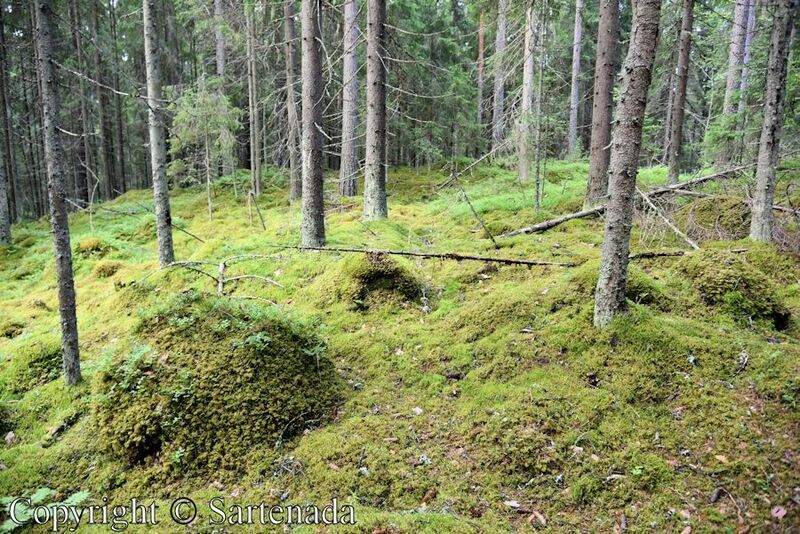 In this post there is no special, just show to how our forests look like. Welcome with us. Anja lleva Vos a través del bosque para algunos peñascos. En este post no hay nada especial, únicamente para Vos mostrar cómo nuestros bosques parecen. Bienvenido con nosotros. Anja Vous mène à travers la forêt pour montrer quelques rochers. Dans ce post, il n’y a rien de spécial, seulement pour montrer comment nos forêts apparaissent. Bienvenue avec nous. Oi gente, tudo bem? Anja leva você através da floresta para mostrar alguns pedregulhos. Neste post, não há nada de especial, só apenas para mostrar como nossas florestas aparecem. Bem-vindo com nós. This looks great! Guess that we have also been on several forest walks with our friend couple. 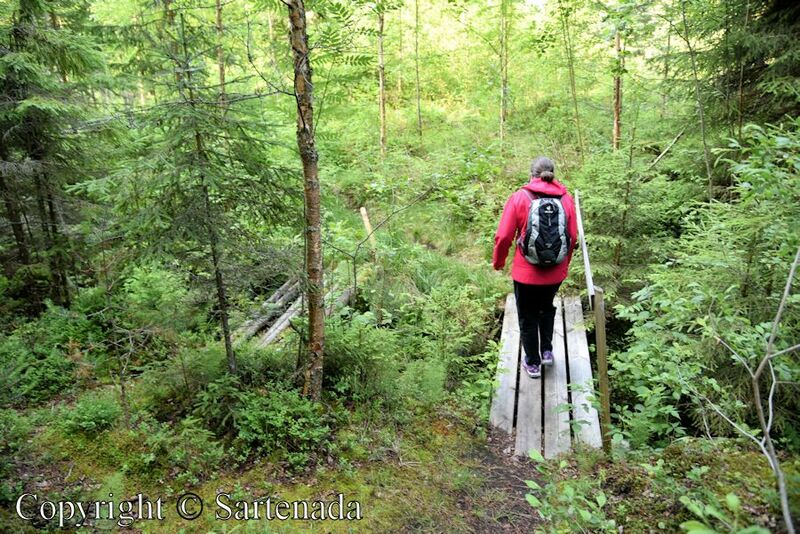 Mostly we are hiking in the national park area of Syöte, Pudasjärvi. Hailuoto is now our favorite, too. It will be more and more in the future since we bought a house there. 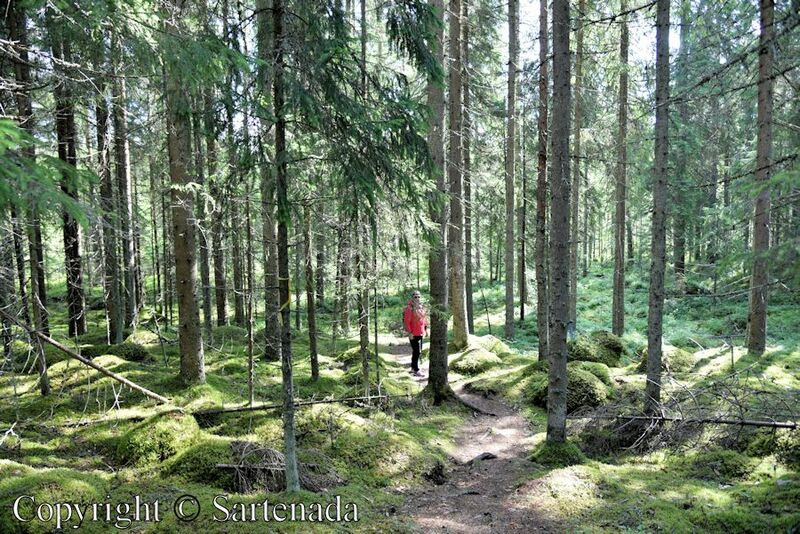 I love the tranquility of Finnish forests and the many shades of green. 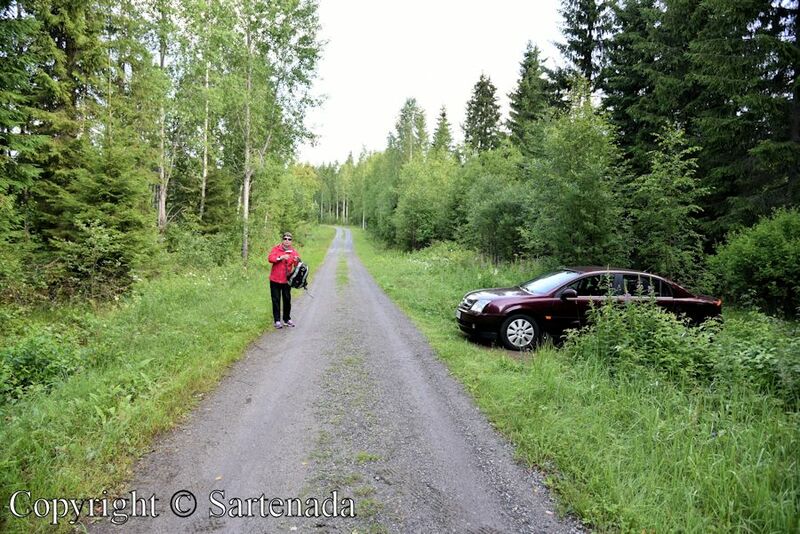 Thank you for posting such nice photos Matti. I am glad that You love this post. 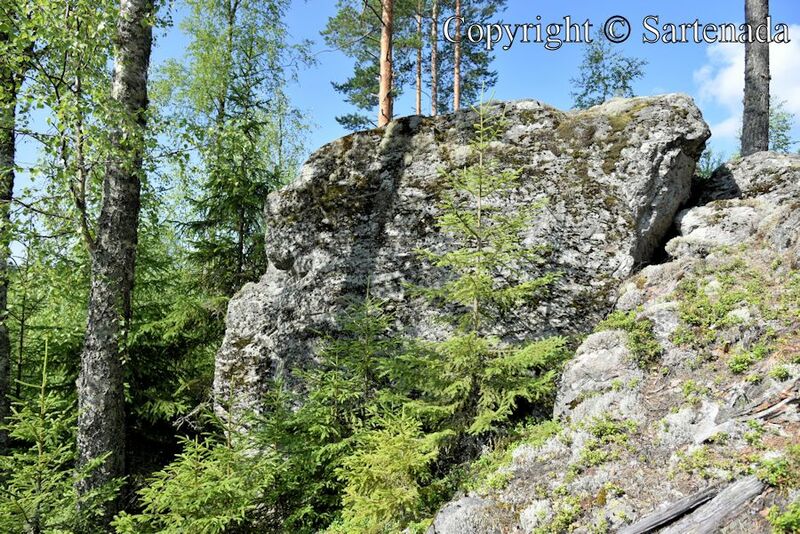 My photos are “old”, dating back about three years from the time when we lived in Mikkeli, which is a small but beautiful town. It is quite safe to walk in our forests and it is just this thing, which we love. Thank You commenting. C’était à quel mois de l’année? C’est en ce moment? Je suis content que vous ayez aimé mon poste modeste. C’était peut-être en juillet il y a trois ans. Nous vivions à Mikkeli et cet endroit c’était très proche de Mikkeli à Otava.La distance entre Helsinki et Mikkeli est d’environ 240 km au nord-est. Merci de m’avoir fait un commentaire. Certains étés sont chauds, d’autres non. À la radio, on nous a dit que cet été, nous avons eu plus de 50 jours lorsque la température a été supérieure à 25 degrés. Ce qui est curieux, c’est que bien au-delà du cercle polaire arctique, certains jours ont eu environ 33 degrés. oui c’est étonnant! serait-ce dû au réchauffement climatique….? Bonjour Maly. Peut-être, mais pendant des décennies, il y a eu des étés chauds. Surtout que c’était vrai dans les années 30. C’était déjà à cette époque que les gens commençaient à penser au réchauffement climatique pour la première fois en Finlande. I love these views of your forest. To my eyes, it is very special! I am very glad that You loved my photos and left You praising comment. Thank You. A lovely forest Matti. Was that a large mushroom?? Yes, it is mushroom. In our forests, everyone has the right to pick mushrooms and berries. In spruce forest there are not so much. Thank You commenting. Oh wow. That was s big one. Maybe it was a Boletaceae, but it was big indeed. Hello! It is a wonderful green forest. I felt the trees enjoying a short summer. Have a good day! It is beautiful forest in its own way. Green color is beautiful in some last photos. Thank You loving my post and its photos. Your forest looks different then ours , we have a lot of brambles ,briers throughout our forest. Love these huge boulders! I enjoyed the walk very much! Thank you! Thank You leaving Your comment and loving pics. What a beautiful, peaceful, place for a walk. Thank you for taking us along with you. I am glad that You my photos and left Your kind comment. 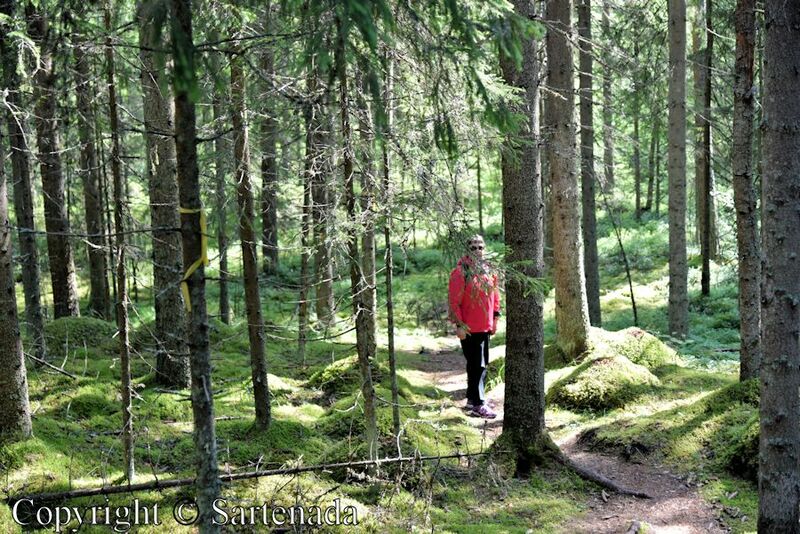 Thanks for showing your forest pictures, Matti! I enjoyed your post very much! I cannot understand how many things You can see in my photos! It is wonderful. Maybe these forests are too well known to me and thus I am not capable to see them and I am “blind”. Actually, I am half-blind, because I lost the sight of my left eye almost five years ago. Thank You commenting. Her red jacket is old, maybe ten year. It is Torstai “Thursday” collection, which is high quality Finnish product. She has weared it in my many posts thru years and always it is new looking. What a pleasure to walk through the forest and come home with these amazing photos! I am glad that You commented my post and loved my pics. Thank You. Thank You commenting and making a question. There birds and squirrels. Also foxes, hares and hedgehogs. 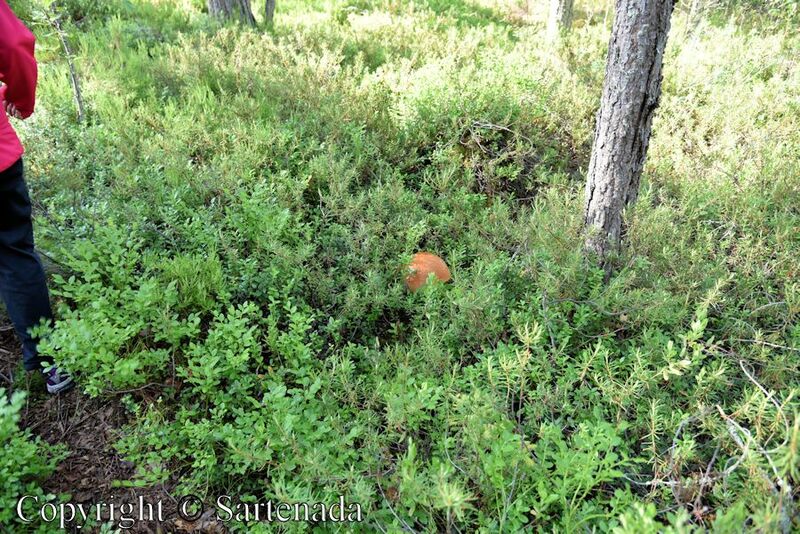 Deer are rare in this kind of forest, because they cannot find food. Elks might be possible, but they are afraid of man. Reindeers live in the north and bears in deep forests. All this means that it is safe to walk in our forest. The green of the fresh forest is wonderful. 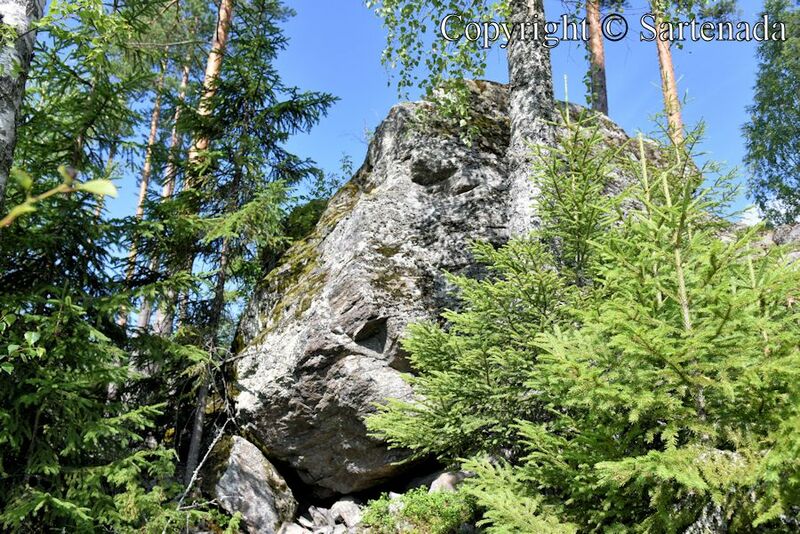 There seems to be a hot day that has never existed before, but is not the trees of the forest also surprised? Thank You. Nowadays trees are suffering from the heat and lack of rainwater. 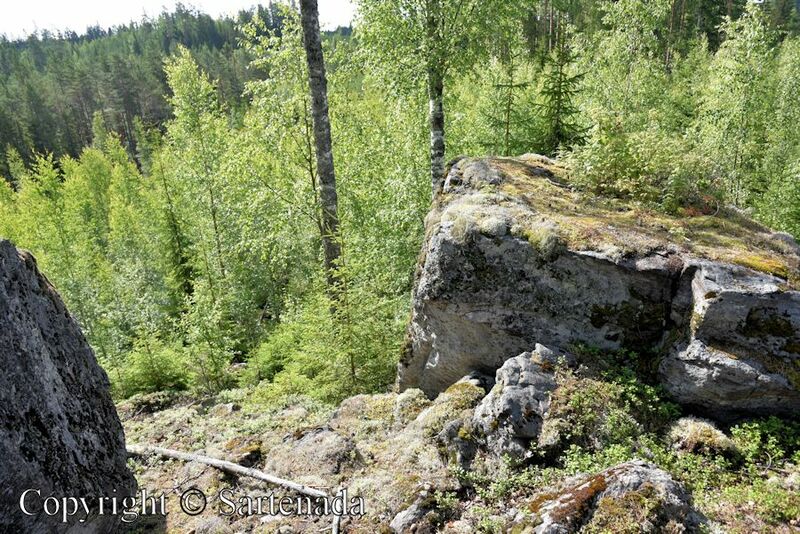 I do not know how much water, spruces need in a day, but birches need about 1000 liters in a day. The denser the forest, the better they protect each other from the hot sun. Very beautiful forest! Hiking on that trail would be very pleasant! Thank You praising my post and loving my post. 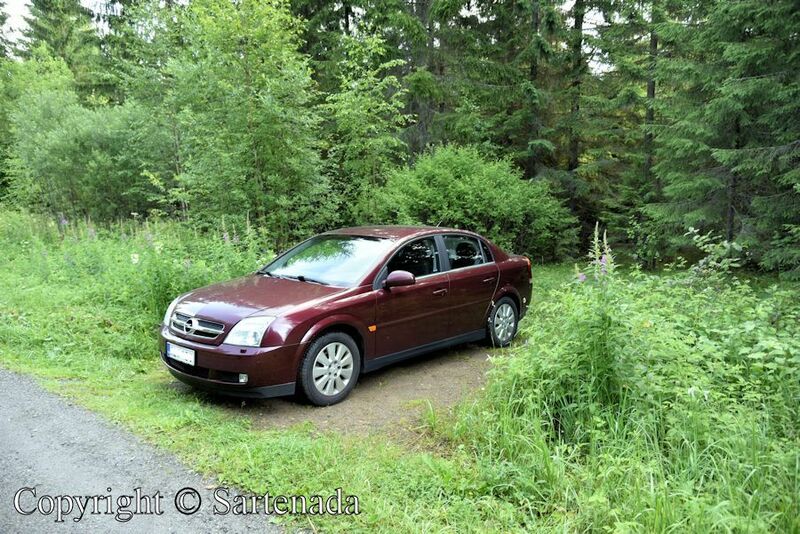 It was nice day and so was the forest also. excellent photos those trees are so darn straight! 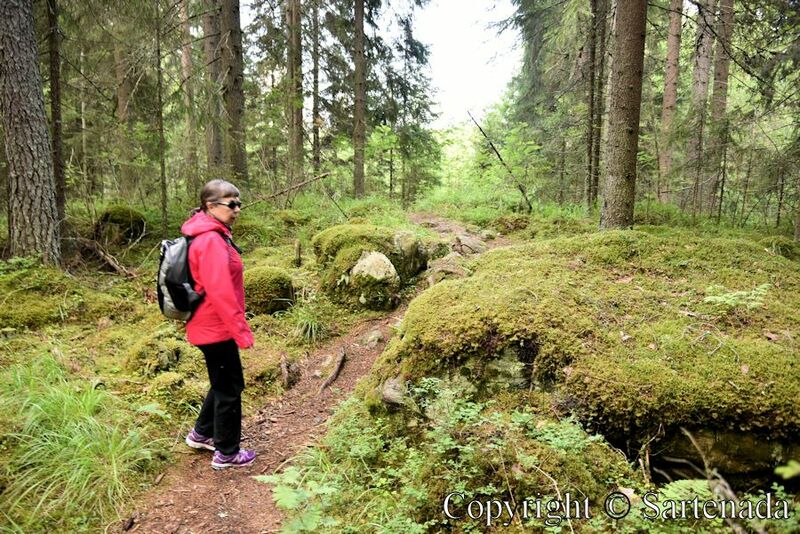 I am glad that You took a forest walk thru my photos. Thank You commenting. Thank you for sharing these beautiful images. 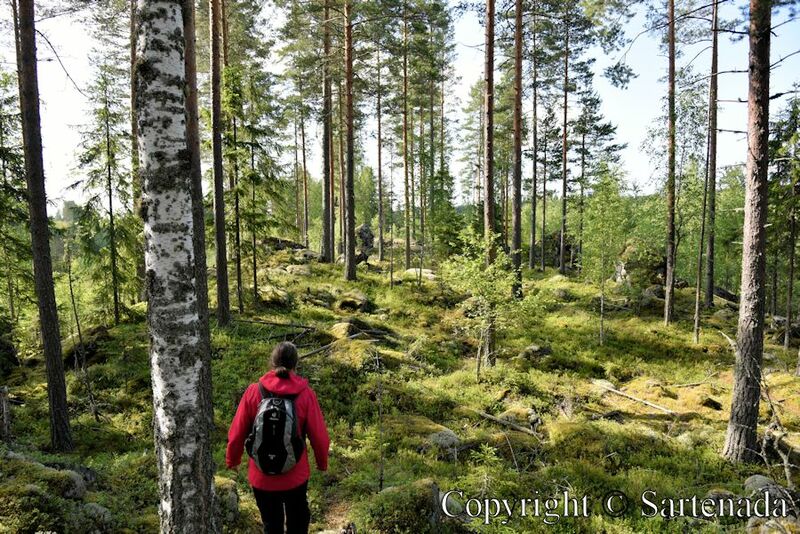 That is one thing I intend to do if I can ever make it to Finland again – wander around in the forest. 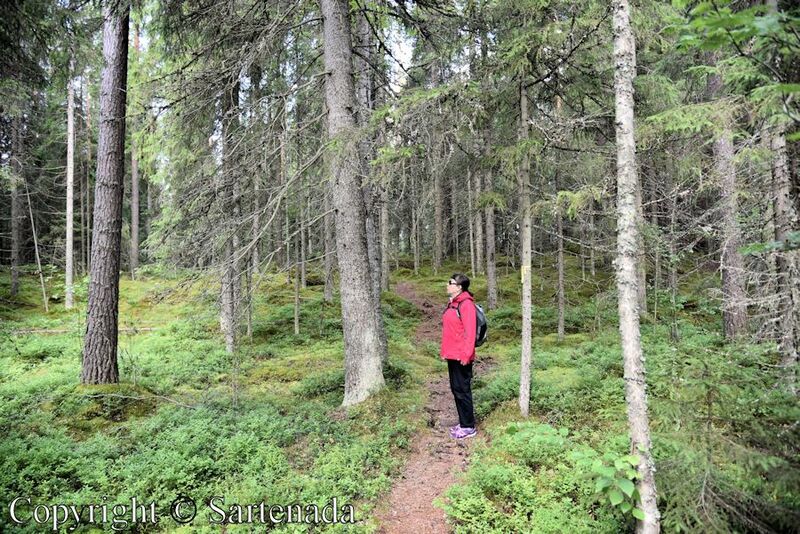 It seems to me that Finnish forests are much softer and gentler than what we have in my part of Canada. I think more sunlight gets through. Thank You for Your kind words. I do not know Canada, only Toronto where we have visited few times and sceneries on the way to Niagara Falls (Canadian side) from Toronto. 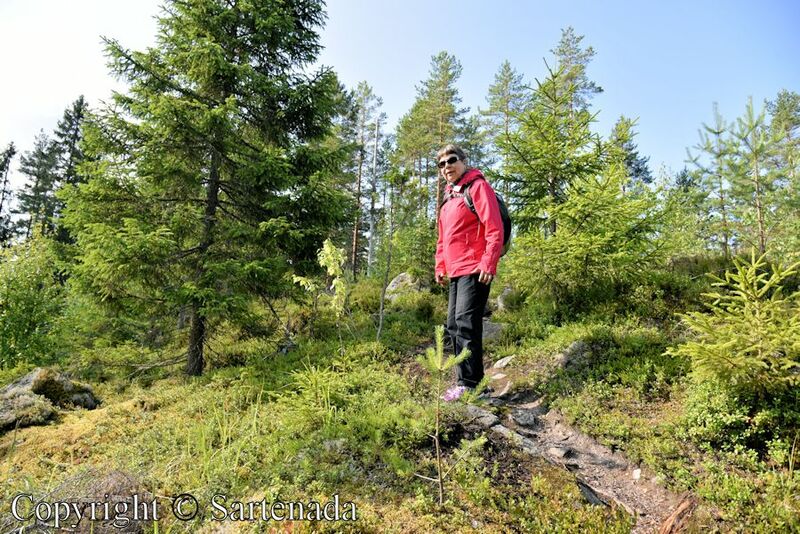 Always a pleasure to visit your blog, Matti! This post made me think of the Swedish saying, Drar til skogen. ( when they intend to be alone!) The serenity and peace found in this nature is something very special. 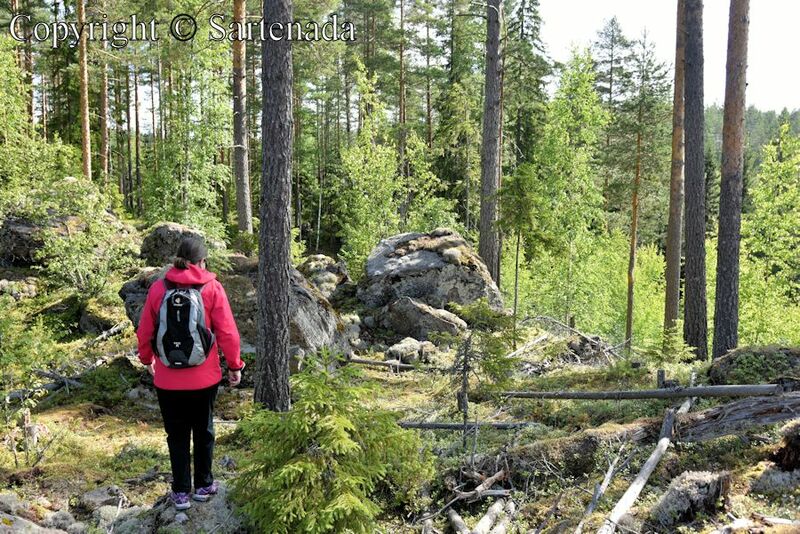 I remember my first glimpse of a Finnish forest. Such a green I had never seen!! It was luminescent! 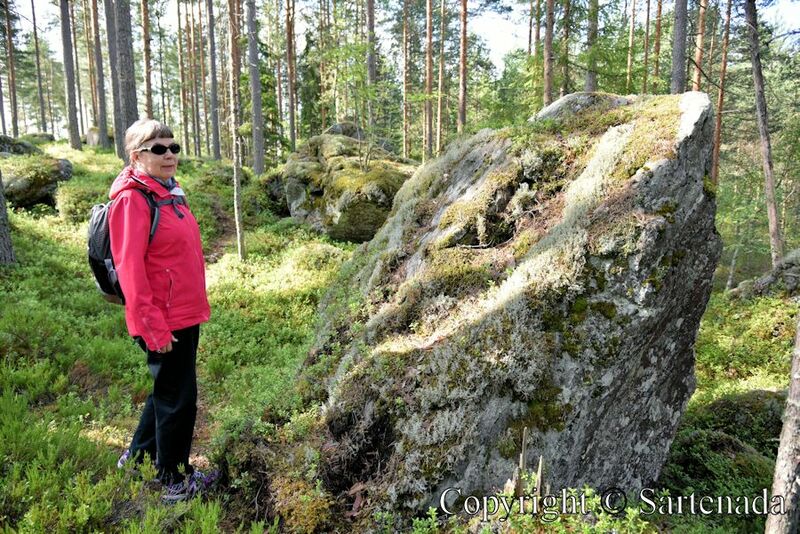 Yes, go to the forest (Drar til skogen). We people are part of nature, although some people living in towns have forgotten it. On the other hand, man needs peace and serenity in his heart. People who have moved from country to cities, they miss back to the nature. I am glad that you left Your kind comment and thus got us to think about our life on the World. Thank You. Thank you Matti. 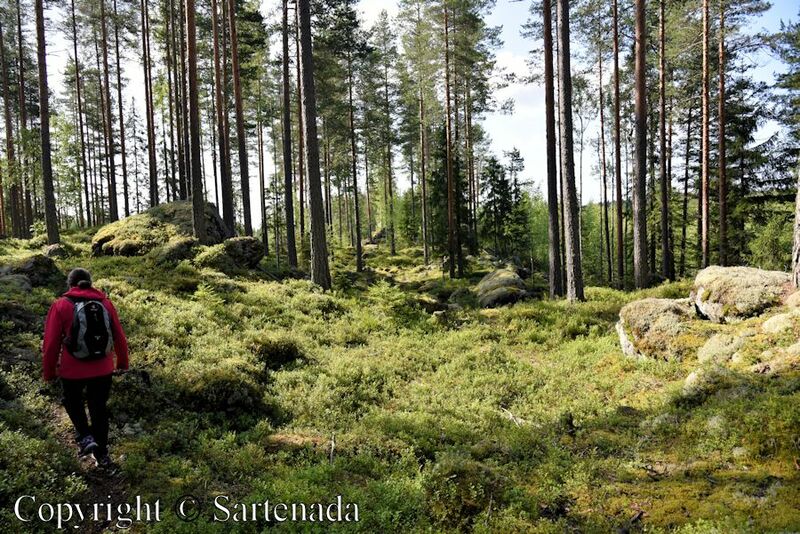 I am about to start my night’s sleep, so perhaps I shall dream of a Finnish forest. So nice to read Your kind comment. I am glad that You participated in this virtual tour thru my photos. Thank You. Bonita caminata por el bosque y ¡ sin cansarme!!! ¡Maravillosa idea! Muy buenas fotos, como siempre Mati. Tus palabras tan amables me calientan mi Corazón. Muchas gracias. I enjoyed the vicarious trek — so green, so lush, and presumably SO COOL. (unlike here, with our heat/doldrums having settled in). Thank you for Your kind comment. This summer we have had hot. Even in the north, in Nuorgam, which is north of the Arctic Circle at the distance of 250 miles, we have had there 91.4℉. good grief! 91?! that is considered HOT here, as you know. I love a good forest walk and your photos are making me want to run out into the woods this minute! Nature and forests give to mind mental strength. We walk often in the nature and pass thru forests if possible. Thank You commenting. 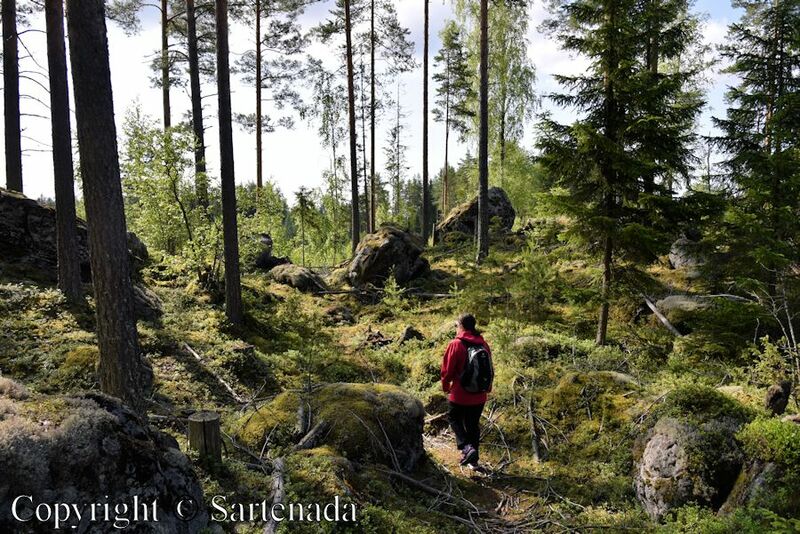 A great report from Finnish forests, Matti! Always beautiful! 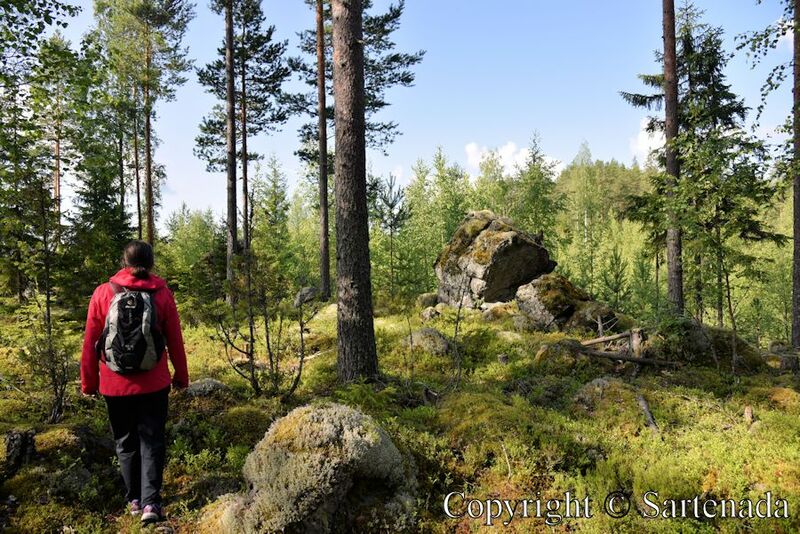 I did several forest walks as well in July in both Sweden and Finland. Thank You commenting. 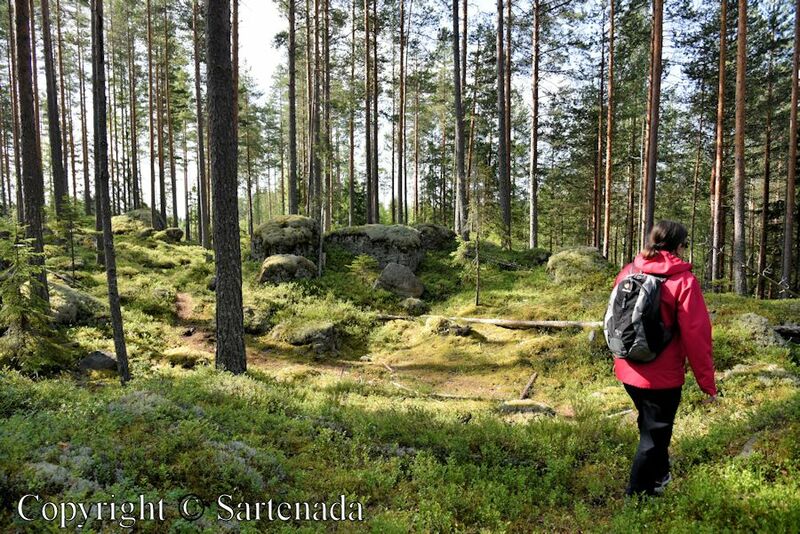 Very nice to read that You visited Finland and Sweden. This summer’s highlight was when my daughter participated in Helsinki Samba Carnival! 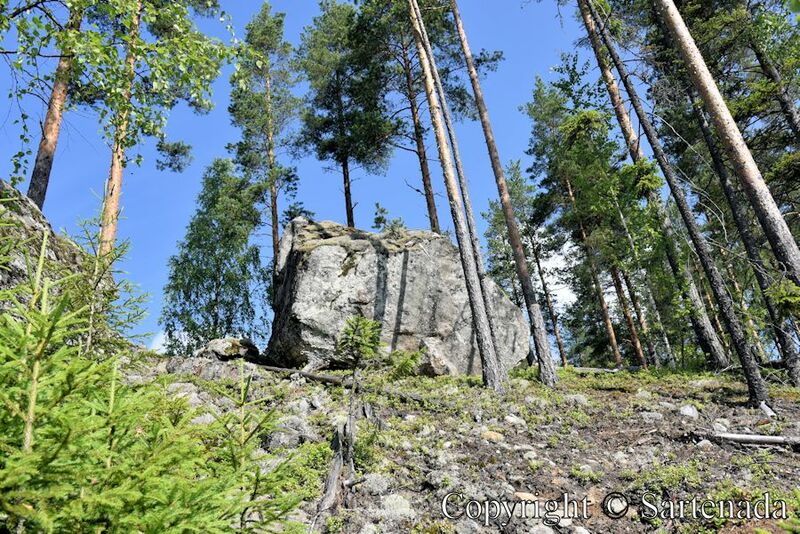 Beautiful forest … thank you for sharing! Thank You leaving Your comment. I am glad that You loved my photos. Very nice photos and views. 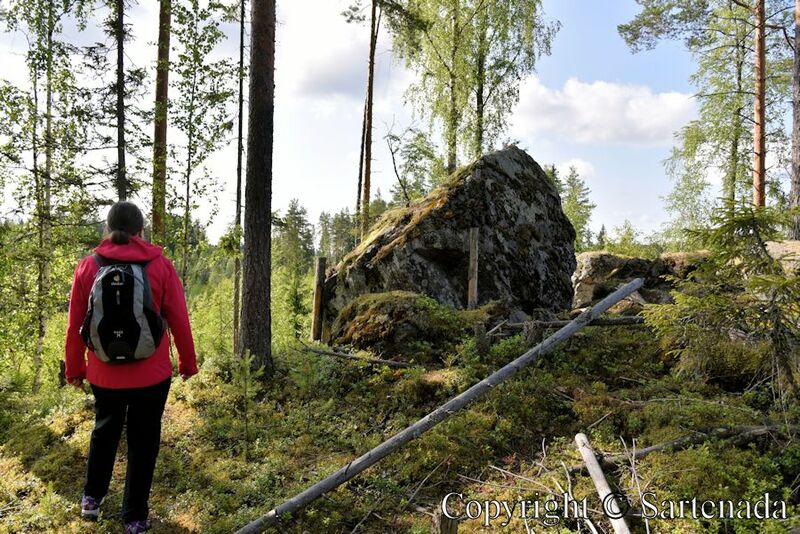 I miss going for walks in Kurjenrahka National Park. Merci pour cette belle balade, très jolie cette forêt! Merci pour ce joli compliment. Je l’apprécie beaucoup. Thank you for the beautiful walk through the woods. Great photos as always. Thank You for Your kind words. 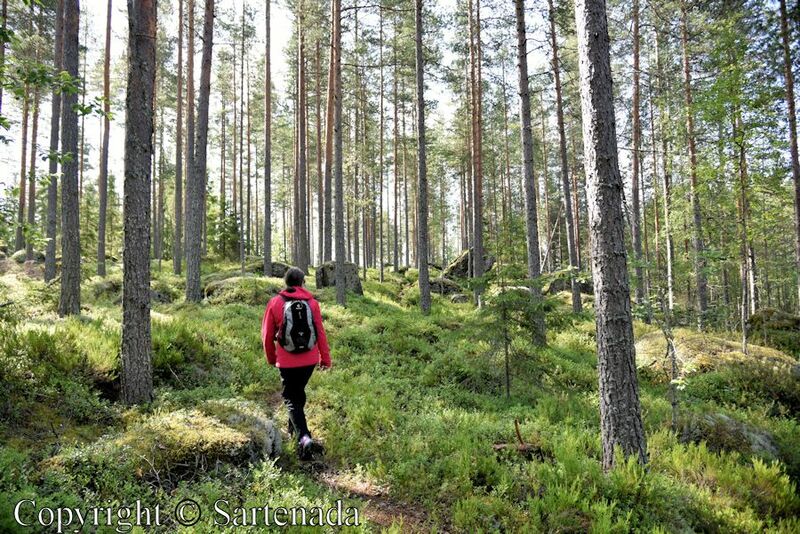 Walking in forests is calming and it is good for a man. Awesome! I think I would get lost in such a big forest. Well, no, because there are around paths leading to small villages. Thank You visiting my blog and commenting so nicely.